“The Grand Canyon of Ethiopia” – Satenaw Ethioopian News & Breaking News: Your right to know! It is a chilly Monday morning in Addis Ababa, with the sun crawling over the horizon. After a refreshing night and hefty breakfast at one of the many hotels sprinkled all over the city centre, I set off together with three Global Water Initiative East Africa (GWI EA) colleagues, on a 500km drive to Bahirdar, home to the beautiful Amhara people and project site of our 63 champion farmers. Over a period of two and a half years, the Global Water Initiative East Africa programme has successfully supported smallholder farmers in Dera Woreda to improve their agricultural production and realise food security. This has been achieved through farmer trainings, on-farm demonstrations, extension support and provision of irrigation technologies such as water pumps, purchased through farmer cooperatives. Our approach has provided the desired multiplier effect, where the cooperatives purchase more pumps – with money paid by the farmers – and which other farmers hire and eventually purchase. Farmers have been trained to appreciate the importance of managing and using the little water available effectively and efficiently for maximum production through supplementary irrigation, especially during the long dry seasons. Sandwiched by colleagues in the backseat of our rented Land Cruiser, I rubbed my hands in gleeful anticipation as the excitement of a road trip through the rift valley gorge to Bahirdar, northeast of Addis Ababa, enveloped me. Not even the reminder that I was on a working visit or the thought of sitting in a car for more than nine hours was going to dampen my spirits. Driving through the city, I was soon struck by the magnitude of history that the people of this land have preserved over the years. Coming from a country where development translates into multi-billion glass buildings and malls, it was time for my patriotism to take a backseat while I rained down glorious chunks of praise on this fascinating land, adorned with beautiful historical architecture. In the heart of the city, sit the palaces of emperors who ruled these lands centuries before. Two that especially caught my eye were the Jubilee palace, a commemoration of the silver jubilee of Emperor Haile Selassie’s coronation, and the National Museum of Ethiopia that houses the fossilised remains of the famous early hominid, Lucy. As we drove away from the hustle and bustle of Addis, the beautiful sights of historical monuments were soon replaced by proof of people still living in absolute poverty and under-development. I was quickly sobered up from my state of awe by the sight of women, some as old as 50 years, racing down the roadside doubly bent over under the immense weight of piles of wood on their backs. “The Grand Canyon of Ethiopia” as Liz, my colleague, chose to baptize it. Located on the western margin of the northwestern plateau of the rift valley, the gorge comes into view some time after leaving behind Debre Libanos and the thrilling drive down and round mountains and plains, a striking scenery that leaves you holding your breath in anticipation for what you just might see next. And there, right at the bottom of the gorge was the spectacle of the Blue Nile river – reduced to shallow waters at this time of the year – as it lazily flowed on its way down from Lake Tana, the largest lake in Ethiopia, to meet the White Nile in Khartoum and flow into Egypt as part of the great Nile. Although the Blue Nile, locally known as the Abbay, is significantly much shorter than the White Nile, it is interestingly the origin of approximately 80 per cent of the water that flows through the great Nile. It is here that a huge 6,000 megawatt dam, the largest in Africa, is being built. Having contributed a set proportion of their incomes, people of Ethiopia – through the purchase of bonds – will co-own this major infrastructure. The government plans to reimburse the people by selling hydropower to neighbouring countries from this grand investment. As we drive closer to Bahirdar, it is hard not to notice the dramatic shift in the landscape and lifestyle of the peoples on this side of the Abbay, especially the unique richness and traditional vibrancy in the air. The first to catch my eye was how the women and girls here shaved their heads completely and covered them up with headscarves. The soils too looked much drier. For as far as the eye could see were bare fields, clustered with heaps of freshly-harvested tef and wheat built into domes and left to dry. On first sight, one would think these delicately-fashioned masses of grass were huts built for accommodation. In a region that receives very little rain and experiences long dry spells, these heaps of food are a comforting reminder that food security may not be a threat to the people here; at least not for months to come. Seven hours down the road, hungry, with our joints protesting and demanding for a stretch, we stopped for lunch at a restaurant in a town called Saint Michael. 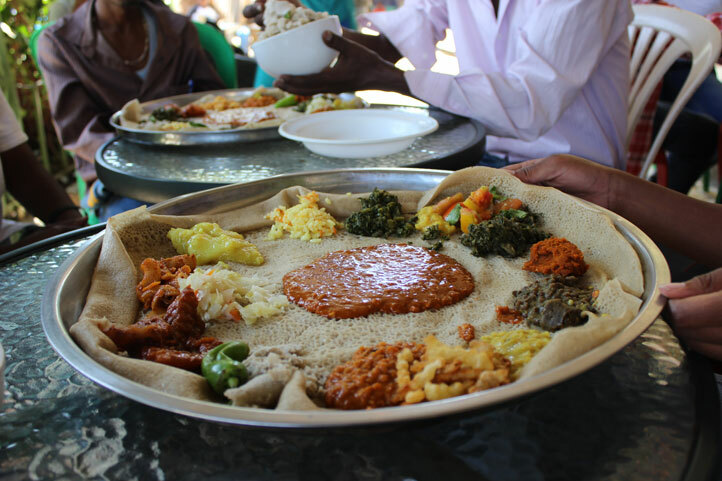 A few minutes after placing our orders, a tray of the traditional Ethiopian food, injera, with an assortment of vegetables and meats, gazed invitingly back at us, tempting our long-starved taste buds. One bite into the spicy cuisine and I realised that this dish was on a fast train to becoming my favourite addiction. Each mouth-watering morsel was a masterpiece waiting to delight my perceptive palates. After the delicious meal, I was presented with a little cup of strong steaming coffee and although the sun was unforgiving and the heat too irreconcilable with a hot drink, I soon learned that under the Ethiopian sky, any time is chai and coffee time. By the time I had drained my cup, I was left in no doubt that this country could very well be where the fine art of brewing coffee was born. As the night set in, the feeling of home away from home descended upon me. Having learned and seen so many unforgettable sights that were a perpetual spectacle to my curious eyes and having perfected my “Oh my goodness” mantra of awe, I finally snuggled back into my seat as the beautiful sounds of Madingo Afework flowed from the car radio washing over my spent soul. I was home. Miles away from Kampala, yes, but this was home. Billionare mohammed Alamudin bought two ethiopian artists a multi-million villa each in addis Ababa.